Millennium Recycling Styrofoam is ALWAYS a No. Styrofoam is ALWAYS a No. Styrofoam Is NOT Recyclable in Sioux Falls. This squeaky, messy material also known as expanded polystyrene is NOT recyclable in Sioux Falls. Plastics are not all created equal and some of them, like Styrofoam, don’t make economic sense to collect or recycle. Private businesses like Millennium Recycling, inc. can only process items that have a demand in the marketplace and cover the costs of collection, processing, and transportation. 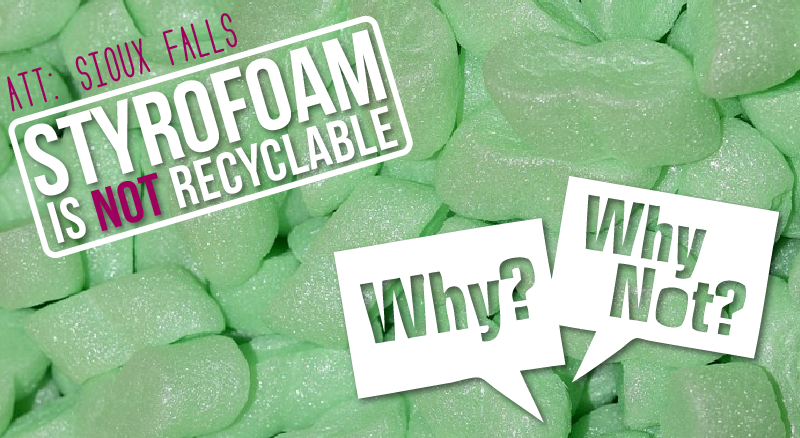 More than 95% of styrofoam is just air, which means it takes up a lot of space, weighs very little, and yields a tiny amount of new material when processed – This makes the logistics of trying to collect it and move it very difficult. There is also no reliable market that currently exists for styrofoam. Some studies have concluded that there are no effective or efficient ways to recycle styrafoam due to the low market value of the material and the high rate of food contamination. Please leave foam coffee cups (paper cups are okay), soda cups, packaging peanuts, packaging foam and any other type of polystyrene or styrofoam OUT of your bin. Make sure you remove it from your cardboad box before recycling. MAIL-IN or DROP-OFF PROGRAMS: Mail-back and drop-off programs such as the Alliance of Foam Packaging Recyclers are available. Just make sure to remove all debris, tape and labels from the material before breaking it into smaller pieces to fit into a box for shipping. If dropping off, contact the location ahead of time to make sure they accept the materials you have. There are 0 comment. on "Styrofoam is ALWAYS a No."